OPEN STUDIO at Old WESTFIELD Smith End Lane Barley SG9 8LH this weekend the 4 and 5 September 2010 11am – 5pm. Christina will show her many paintings also ceramics , textiles. Cards will also be for sale. 20% of sales will go to donations for Barley Church. All Welcome. An exhibition of paintings and textiles. 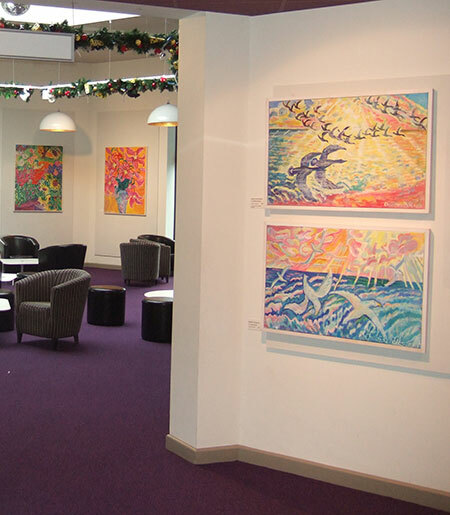 24 paintings on the Art-walk in Addenbrookes Hospital, Cambridge. 15 January - 22 February 2008. Solo exhibition at Broxbourne Theatre, the Civic Centre, Hoddesdon Exhibition in Addenbrooks Hospital continues as before. May 2003 Solo Exhibition at the Courtyard Gallery, Hertford. Nov/Dec 2002 Solo Exhibition at the Townhouse Barley. May 2001 Solo exhibition at the Townhouse, Barley. Sept. 2001 Open Studio, Westfield, Barley.